When I first saw the trailer for the recent A-Team movie, I was startled by how they managed to make Liam Neeson look like George Peppard. I mean, Neeson certainly doesn't look like him normally, at all, so big props went to makeup, CGI, and his force of will over his facial muscles. Well, that opinion may have changed slightly with greater exposure to the material, but it is excellent to have this uncanny likeness, or at least the notion thereof, captured in forever-plastic form by Jazwares. 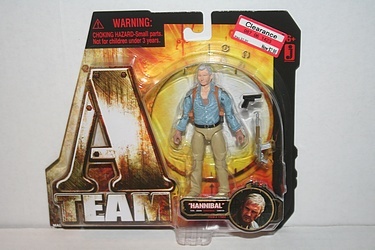 Here then is Col. John 'Hannibal' Smith in 3 3/4" scale from their new and short lived toy line. Click the image for a few more angles, and no bio at all thanks to the hastily thrown together packaging.